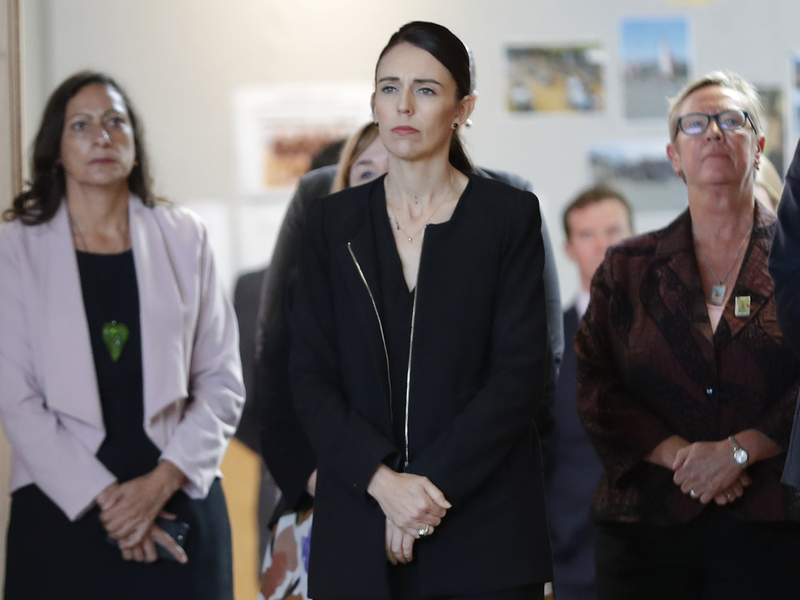 In Wake Of Mass Shooting, New Zealand's Ardern Calls For Global Fight Against Racism The prime minister visited a school that lost two current students and one former student in the Christchurch mosque shootings last week. New Zealand's Prime Minister Jacinda Ardern visited Cashmere High School in Christchurch, which lost two current students to the shootings at two mosques last Friday that killed 50 people. Her first stop was at Cashmere High School, which lost two current students and one former student in last week's shooting, NPR's Rob Schmitz reported. "It is OK to grieve," she told the students and faculty. "It is OK to help even if you weren't directly effected." Her visit came amid the first funerals of the victims from last week's shooting. Khaled and Hamza Mustafa, a Syrian father and his 15-year-old son, were among the first to be buried on Wednesday. Zaed Mustafa, 13, the brother of Hamza and son of Khaled, was also wounded in the shooting and attended the funeral in a wheelchair. "I think any person who's been a former head of government or current head of government would feel that, if one of their own nationals was responsible for an action like this," Rudd said. He pointed to a "global...social media ecosystem of hatred" as responsible for the rise of far-right or alt-right ideology and "Islamophobic, highly racist" sentiment. The shooter wrote about a "white genocide" in a lengthy screed he published minutes before he carried out his attack. In an interview with the BBC, Ardern said that while the attacker was Australian, "that is not to say that we do not have an ideology in New Zealand that would be an affront to the majority of New Zealanders." She issued a global call to weed out right-wing nationalism. "If we want to make sure globally that we are a safe and tolerant and inclusive world we cannot think about this in terms of boundaries."